The Nebraska Conference for Undergraduate Women in Mathematics is for outstanding undergraduate women mathematicians at all stages of their careers. Students will have the opportunity to meet other women who share their interest in the mathematical sciences, and those who have already done research will be given an opportunity to present their results. Conference participants will also have a chance to learn about life in graduate school from the perspective of current women graduate students representing math departments from across the country. The Postbaccalaureate Program is for women with bachelor’s degrees who did not major in mathematics or whose mathematics major was light. This program is open to all women with a serious interest in pursuing a higher degree in the mathematical sciences. Successful applicants will have completed at least Linear Algebra and Vector Calculus before enrolling in our program. The program is designed to make you “graduate school ready” in one year. The Carleton College Summer Mathematics Program for Women is an NSF-funded program to encourage and support women in their study of mathematics. 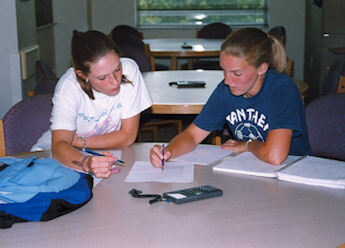 The goals of the program include introducing students to new areas of mathematics; honing students’ mathematical reasoning, proof writing, problem solving, and presentation skills; building self-confidence, encouraging enthusiasm for mathematics, and increasing awareness of opportunities for continued study in the mathematical sciences; connecting students into a supportive network of other female college math majors, graduates and professionals to support them through their graduate studies in mathematics. The George Washington University Summer Program for Women in Mathematics (SPWM) is a five-week intensive program for mathematically- talented undergraduate women who are completing their junior year and may be contemplating graduate study in the mathematical sciences. Goals of this program are to communicate an enthusiasm for mathematics, to develop research skills, to cultivate mathematical self-confidence and independence, and to promote success in graduate school. The summer program aims to strengthen the ability of women to successfully complete graduate programs in the mathematical sciences, through workshops on the core areas of analysis and algebra, mentoring program, and formation of a support network. Graduating seniors who have applied to graduate programs and those about to enter PhD programs can apply. The Infinite Possibilities Conference (IPC) is a national conference that is designed to promote, educate, encourage and support minority women interested in mathematics and statistics. A great networking opportunity, held at the Joint Math Meeting and SIAM Annual Meeting each year. A collection of general information and resources for postdocs on managing their family lives while furthering their research careers. Report by the Committee on Women in Science, Engineering, and Medicine (located toward bottom of page). The website also includes other reports on challenges of women in science. Workshops and resources for faculty, including time management skills, navigating academic culture, and other skills. Also has some resources for grad students, post-docs, administrators, and faculty at different career points (tenure-track vs mid-career). The Association for Women in Mathematics has administered the NSF-AWM Travel Grant Program for Women since 1988, supporting both travel to domestic or foreign research conferences and, more recently, longer-term visits with a mentor. The purpose of the travel grants is to enhance the research activities of women mathematicians and increase their visibility in various research venues. The MAA awards grants for projects designed to encourage college and university women or high school and middle school girls to study mathematics. The MAA, on behalf of the Tensor Foundation, is soliciting college, university and secondary mathematics faculty (in conjunction with college or university faculty) and their departments and institutions to submit proposals. Projects may replicate existing successful projects, adapt components of such projects, or be innovative. Two professional development workshops designed to help women be more effective in leading or participating in discussions, meetings, and group negotiations will take place the day prior to the SIAM Annual Meeting (Sunday, July 8, 2012) at the same location in Minneapolis, Minnesota. The morning half-day session was targeted to senior faculty women and the afternoon session to junior faculty women who are in their first years of academia. The workshops combined self-presentation, leadership training, and faculty development in an interactive format. Priority registration was given to women but male participants were also invited. An online forum from an AWM panel on maintaining an active research career via collaboration and coauthoring. This workshop will familiarize women in the mathematical sciences with professional opportunities in academics, industry and government labs and help them thrive in mathematics-related fields.